The JustRite Summer Release #1 sneak peeks started last week have you seen some of the great new sets that will be available from JustRite on July 1st? Of course with the new release also comes some wonderful Blog Candy from Just Rite, be sure to read on for more information. 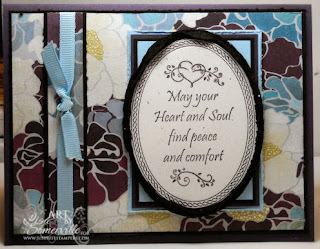 For the base of my card, I used one of the beautiful floral patterns in the Basic Grey Wisteria Pack. I pulled out Eggplant and Bashful Blue card stock from Stampin' Up! to coordinate with the colors in the paper. The sentiment and border from the new JustRite Thinking of You Set was placed on the Oval 2-1/4" x 3-1/16" Wooden Stamper and stamped in Eggplant on Confetti card stock, then cut using the Big Shot and Oval Nestabilities by Spellbinders. 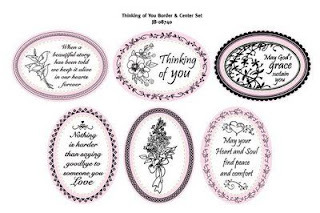 I cut a larger Black Oval to back the sentiment, then used the Torn Frames Technique from a past TJNL to pull the papers around the stamped sentiment. To add a bit of sparkle to the flourish on the stamped image, I used a Spica Glitter pen. Thanks for stopping by. Be sure to check back later this week, as I'll be sharing a great recipe for Black Beans and Salsa using the new Preserves Set. Beautiful artwork Lisa... and I love the stamps! Your card is so beautiful, Lisa!! I really love all these images...hmmm may need to add to my list of NEEDS! LOL!! Lisa, your card is Gorgeous! I love the BG designer paper--beautiful colors! This is really beautiful! Love the image with that pretty paper! Love your card. Perfect set of sentiments. Need to be put on my list of 'must haves'.